From a humble playing-card company to a multinational giant, the Japan-based Nintendo has become one of the leading players of the video game industry. It’s almost hard to believe how far the company has come over years. Nintendo has had a fantastic history and has evolved dramatically since they first started to become the largest manufacturer of video game consoles in the world. Since the last three decades, the company has been at the forefront of console gaming industry. It’s over a decade since Nintendo triggered a slew of the DS series of handheld video game consoles including the 2011’s 3DS and 2013’s 2DS. Nintendo devices has iterated over years with frequent makeovers which makes it pretty confusing to choose the right one. We took it upon ourselves to look at all the options available including the original 3DS and 2DS consoles to make it easy for you to choose between the two. The Nintendo 2DS is an entry-level handheld device of the 3DS family of portable game consoles announced in the late 2013. It belongs to the DS family of handheld systems which still is one of the Nintendo’s best ever handheld consoles. It is a budget-friendly alternative to the original 3DS with a slate-like form factor and unlike the 3DS, it doesn’t fold. Although the lack of hinges makes it less vulnerable to breaking, the hinge-less design also makes it a little hard to fit in pockets or stash in a bag. It compromises on portability but increases durability at the same time. It is powered by a dual-core ARM11 MPCore processor and a single-sore ARM9 chip, along with a PICA200 custom GPU. The original Nintendo 3DS is a dedicated handheld console released in 2010 as a potential successor to its already popular Nintendo DS with backward compatibility to play older DS games. It’s a dual-screen handheld with a clamshell design which gives it a big advantage regarding portability and ease of use a you can easily stash it away in your bag or stuff it into your pocket. 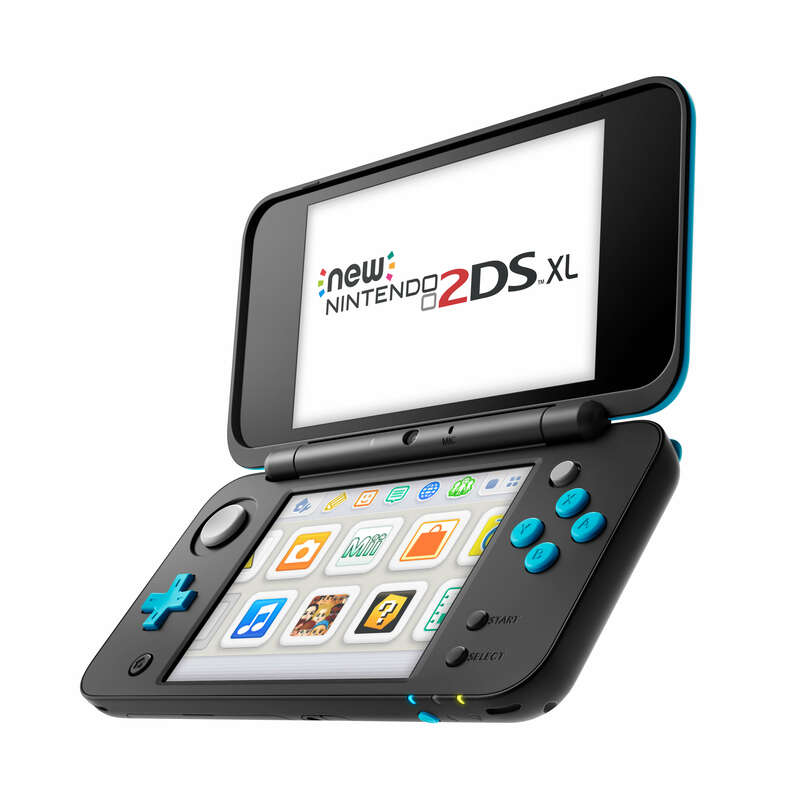 Unlike the non-foldable design of the 2DS, it has hinges which makes it prone to breaking during accidental falls. The upper screen is 3.53-inch and the lower screen is 3.02-inch. The one thing that makes the 3DS stand apart is the autostereoscopic screen which is capable of producing wonderful 3D effects without the glasses. Both belong to the Nintendo DS series of dual-screen handheld video game consoles with almost similar features and hardware configuration. However, the slate tile-inspired 2DS is differentiated by sleek form factor just like the 3DS but without the hinges. It’s made of matte plastic which makes it look more like a toy plus it’s a little more on the heavier side. The 3DS is undoubtedly the best Nintendo ever, thanks to the stereoscopic screen which is capable of offering 3D effects without the need for 3D glasses. The 2DS is the entry level iteration of the original 3DS with identical hardware such as the dual-screen with same screen sizes; the upper screen on both the models measures 3.53-inch and the lower screen is slightly smaller with 3.02-inch. Both the devices boast LCD screens with a display resolution of 400×240 px and the lower screen has a display resolution of 320×240 px. The 2DS has basically a flat screen that’s split into halves by a plastic screen that surrounds the console. The 2DS took a different approach with the design from its precursors, ditching the signature clamshell design and rather taking a slate-like design which makes it a little odd to hold. Plus the lack of hinges reduces portability in the console but improves on the durability on the long run. Additionally, the 2DS is a little bigger than the 3DS with 127mm against the 3DS’s 74mm making it virtually impossible to fit in most pockets or throw in a bag for that matter. 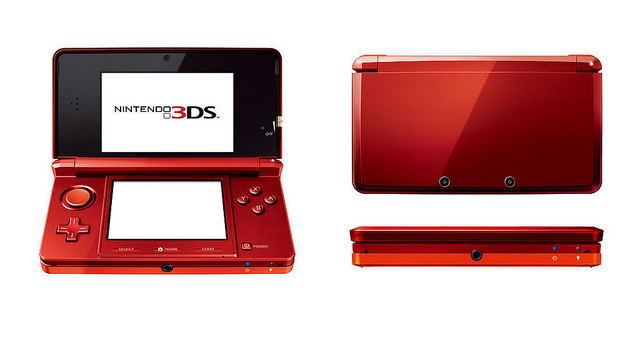 And the clamshell design protects the screen of the 3DS from accidental falls. Both the consoles have identical features except the 2DS lacks the autostereoscopic effect which is probably the main selling point of the 3DS. It has sliders on the side of the screen allowing the users to toggle the 3D effects of the device which is called the auto autostereoscopic 3D effect. The autostereoscopic screen produces amazing stereoscopic images without the need for special headgear or 3D glasses. Because no 3D glasses are required, it is also called glass-less 3D which delivers impressive 3D-depth effects. While both the game consoles are almost identical on the hardware and software except for a fewer design differences and a glass-less stereoscopic effect. The 2DS seems to be a sensible choice for the newbies who aren’t much concerned by the missing autostereoscopic effect or interested in the latest games for that matter. The 2DS is almost 3DS but without the hinges which is actually good when it comes to durability because it makes the 2DS less vulnerable to accidental falls. On the other hand, for more experienced gamers who can spare a little extra cash for a better gaming experience on the top of the glass-less 3D effects, the 3DS is the one to choose. Well, the 2DS won’t let you down either. Sagar Khillar. 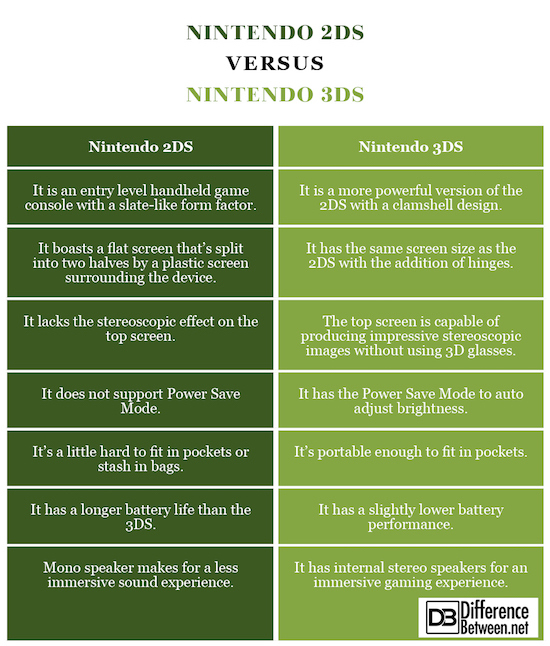 "Difference Between Nintendo 2DS and 3DS." DifferenceBetween.net. May 22, 2018 < http://www.differencebetween.net/object/gadgets-object/difference-between-nintendo-2ds-and-3ds/ >.